Ever have one of those days when EVERYTHING is due? June 30 is one of those days! That is the last day for the Early Bird Registration for the CASE/NASDSE joint fall conference and the last day to nominate a new administrator for the CASE "G" award. It is also just 4 days away so you need to get busy! Can you believe July is almost here? What happened to June! Summer is truly rushing by! As you read this edition of the CASE weekly update, I am actually in Breckenridge, CO attending the Midwest Educational Leadership Conference (MELC). This is an annual conference started 33 years ago by a group of special education administrators from about 7 midwestern states. I have been fortunate to have attended in the past a couple of times. It is always in the lovely mountains of CO. I believe it was the year I attended when it was in Vail that I had the inspiration for our CASE Leadership series — a kind of SPED ADMIN 101. 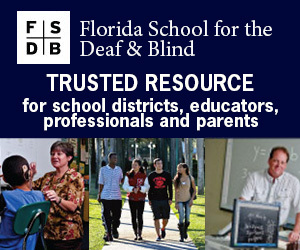 I had just recently had a couple of calls from district superintendents who had hired people for their special education directors who had never even taught special education and they wanted to know if we had any resources for them! My first response to them was why did you do that! But, the reality is, so many people do actually "fall" into special education administration with very little experience! Those folks especially need their state/provincial units and regional colleagues to help them. They also need the resources that will be available at the Fall conference! AND if they survive and do a great job, they need to be nominated for the "G" award! Pass the word! I know it is close, but it really isn't too late to register for the CEC/CASE Legislative Summit but time is running out! We have all but 7 states represented! And there are only 10 more registrations left so you need to hurry before it is closed due to the numbers! The more representatives we have the bigger our impact — we need you to consider registering today for this most important advocacy opportunity you will have this year! The deadline for the hotel group rate has passed but you may still be able to get a room or they may direct you to other hotels but make your hotel room reservation ASAP! You can get other information on the dedicated website for the Summit! See you in D.C.! Only 3 more days! The Early Bird registration for the historic CASE/NASDSE Joint Fall Conference is only good through June 30. This is the lowest price you will be able to get the registration for so don't let this deadline slip up on you! We are anticipating a record crowd so go ahead and reserve your hotel room with a room rate of $129 this will be a great conference that will also be easy on your budget! To learn all about this conference, the rates, and other important information, download the registration packet or go to the www.casecec.org for all the information and links! Be sure to get this on your calendar and in your budget as you will not want to miss this historic event! So I have decided to try and offer you a FREE resource each week if I can. Last week I mentioned the great CEC Tool of the Week! I hope you tried that one out and remember it is new each week. So this week I want you to know about the great items on the NCII website. According to the website, Intensive intervention helps students with severe and persistent learning or behavioral needs. The Center's approach to intensive intervention is data-based individualization (DBI). DBI is a research-based process for individualizing and intensifying interventions through the systematic use of assessment data, validated interventions, and research-based adaptation strategies. There is a section on the website that is all about free resources. Check them out today! 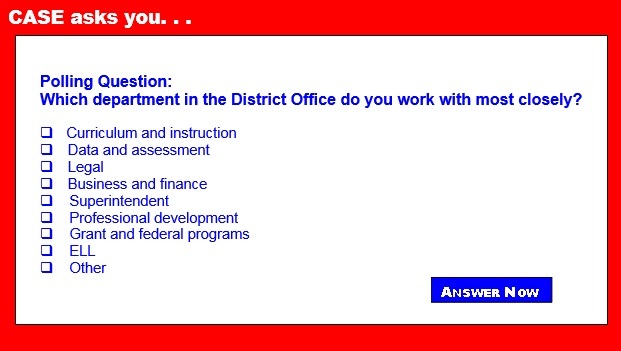 The Poll for last weeks asked what helped you the most when you first started your special education administration career. There was a tie for first place with 30 percent: regional special education groups and mentors. I can tell you right now I would have loved to have had a mentor! That wasn't even a term many folks used back in the early 80s but I had lots of informal mentors — and they all were in GA CASE! Second place was also a tie at 20 percent between the state/provincial CASE group materials, publications, resources, events, leaders and other administrators in the district. Clearly it is our colleagues who are so critical to our on the job training! No one listed professors or materials as such. It truly takes a breathing person to help us out! Give yourself a hand for being so critically important to those around you! The emotional toll from the mass shooting in Orlando, Florida, continues to resonate both locally and nationwide. Following a tragedy of this magnitude, mental health support can make a substantial difference in beginning to heal a traumatized community. SAMHSA has tools and resources to support survivors, community members, responders, and behavioral health providers to foster recovery and resilience.